My experience with the State Department has convinced me that it has never proven itself to be particularly effective no matter what the administration, and it continues to fall to the level of my expectations. A two-state solution will be clearly underscored as the only real alternative – because a unitary state winds up either being an apartheid state with second-class citizens, or it ends up being a state that destroys the capacity of Israel to be a Jewish state. 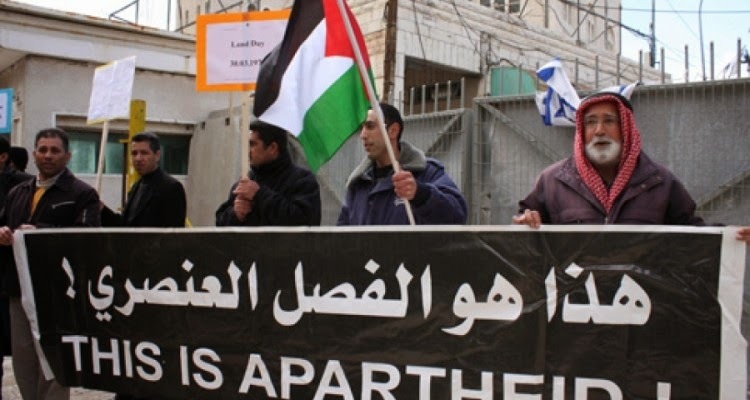 There's no doubt that Israel and the Palestinians have tough issues to work out to get to the goal of two states living side by side in peace and security, but injecting a term like 'apartheid' into the discussion doesn't advance that goal. It's emotionally loaded, historically inaccurate, and that's not what I believe. Apartheid in Israel is what Jimmy Carter holds to, though. Perhaps jealous that Obama is stealing his limelight as the worst President in history, Carter went so far as to write an entire book on the subject. We have enough time to do any number of things, including the potential at some point in time that we will just put something out there. "Here it is, folks. This is what it looks like. Take it or leave it." 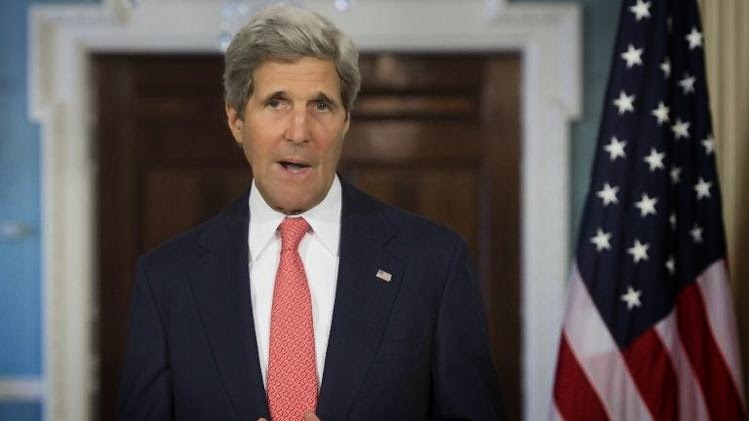 John Kerry imposing a peace settlement on the two parties – exactly how would he go about accomplishing that? The two factions, perhaps the most diabolically opposed on the planet, meekly submitting to the demands of … John Kerry? Would he accomplish this through UN Ambassador Samantha Powers' earlier suggestion that we deploy troops – a "mammoth protection force" – to separate the factions and monitor developments in an imposed peace settlement, meaning foreign troops (likely our own) keeping tabs on Israeli army units inside their own country? To add insult to injury, Kerry's remarks came just before the Israeli observance of Holocaust Day. (Just like Powers' gushing over Jane Fonda just before Veterans Day.) This is quite a team. Kerry issued a statement on Monday about how he "regrets" the comment, that he should have used other words. His apologists are focused instead on attacking the messenger, Daily Beast reporter Josh Rogin, and questioning how he obtained the recorded remarks. Kerry's comments were supposed to be somehow protected because of the stipulation within the Trilateral Commission meeting that all remarks are off the record, but this is a distraction from the fact that Kerry actually said them. Kerry's frustration stems from the fact that Israel withdrew from talks with the Palestinian Authority. Mahmoud Abbas skillfully played a proclaimed concession that the PA would consider recognizing Israel, though not as a Jewish state. He immediately thereafter agreed to a unity pact with Hamas, which controls the Gaza Strip and which also is dedicated to the destruction of Israel. Israel cannot agree to negotiate with terrorists such as Hamas, yet it is nevertheless portrayed as reneging on talks after a major concession by Abbas. Kerry's reaction was what Abbas expected. 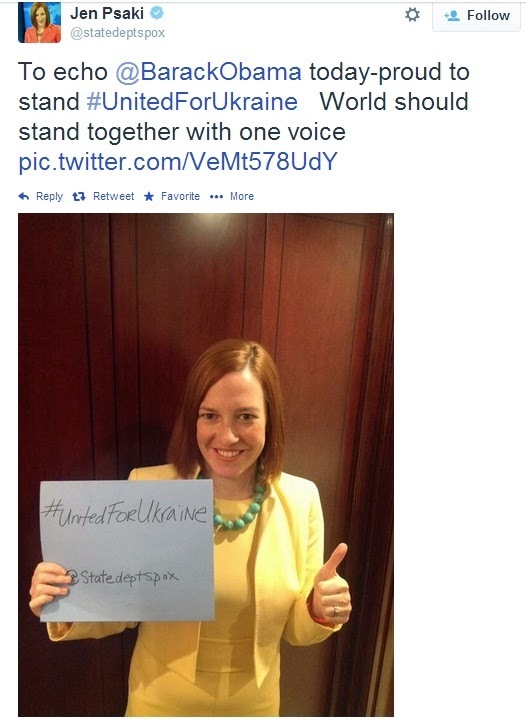 In other developments (if 'development' can be used to convey a sense of non-accomplishment), the State Department continues its feckless blithering about the deteriorating situation in Ukraine, and doing so in a manner that is ludicrous to any reasonable observer, which clearly excludes such people as spokesperson Jen Psaki. 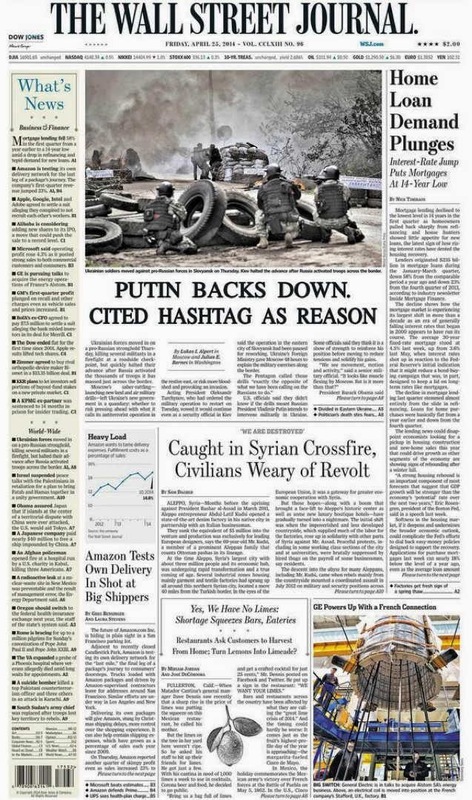 This wet-noodle approach fits nicely with our economic sanctions against an 'escalating' number of Russian politicians, and each time the number has been less than the one leaked to the press beforehand, drawing attention to the Europeans who dilute the already pathetic threat, who talk a good game yet fear economic repercussions from Russia. Photos of Putin hugging his friend, former German Chancellor Gerhard Schröder, at a birthday bash that Putin threw in his honor capitalize on the fact that the West has no unified front, and the Russians want to take every opportunity to demonstrate that. "Alles Gute zum Geburtstag, Tovarishch!" Every day brings more examples. Russian Deputy Prime Minister Dmitri Rogozin, one of the original eleven sanctioned Russian officials on our list (and who publically laughed about it), is also the official in charge of the Russian space program. He is thus not only the gateway we must pass through in order to continue to launch our astronauts to the International Space Station (seeing as how we have abandoned our manned space program under Obama), but we are also dependent on him to supply the rocket engines necessary for our launches of satellites by Delta IV and Atlas V launch systems. Yes, our own rockets now have to use Russian engines. And that gateway just slammed shut. In retaliation for sanctions against export of some high-tech items to Russia, Rogozin just announced that henceforth "the United States delivers its astronauts to the ISS with the help of a trampoline." Our sanctions against the Russians also don't touch our contract for them to supply attack helicopters, with parts and maintenance contracts, to the Afghans. Yes, we are paying the Russians to supply and maintain some 90 attack helicopters against the day that we abandon Afghanistan altogether. So, do you believe that Obama has lived up to his claim that the world respects us more with him in the White House? 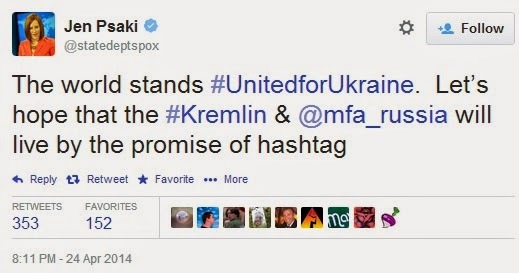 You just gotta believe in the power of hashtag. Update: The Russians make good on their threat to retaliate against what remains of the American space program.